In addition to walking and hiking, Asturias is rapidly developing a reputation as somewhere to enjoy a wide range of adventure sports. The river Sella is one of the major rivers in Spain and parts of its path enjoy not only scenic riverside views, but also a little bit of "white" water. The Sella first gained notoriety as a canoeing river in 1930 when a group of friends decided to take a trip down its path and by the mid nineteen forties this canoeing excursion was attracting large numbers of canoeists and some spectators. By the late twentieth century this event, now a major festival and called the "International descent of the river Sella", was being officially organised and staged annually on the first Saturday of every August. The actual race covers the path of the river between two bridges, one at Arriondas and the other at Ribadesella and it is watched by thousands of spectators. The festival is probably the most important in the Asturian calendar is perhaps close the England’s Oxford versus Cambridge boat race in its regional fame and notoriety. The canoeing appeal to many tourists is to take the "International descent" route (which is on a shallow and calm part of the river) and have a relaxing and usually humorous few hours paddling, and sometimes pushing, their canoe down the river. 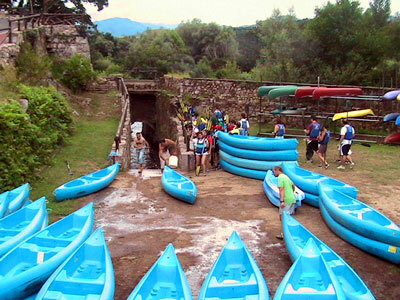 The popularity of this pass time cannot over exaggerated and quite literally thousands of "would be" canoeists try out this activity and route during the summer months. It is for "first timers" every bit as much as it is for experts. 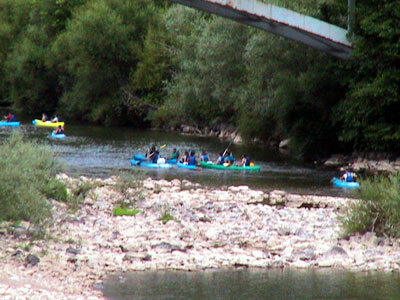 As a result of the “International descent of the river Sella”, the river is now used year long by canoeists, most of whom travel from other parts of Spain and the world to enjoy its challenge. Right, this is the scene at one of the many canoe rental centers where the canoes and associated equipment can be rented. The canoeists are then dispatched down a chute and in to the river - all very exciting. The greater part of the river has calm waters and most of its canoeists take to the water for the relaxation rather than a physical test. Many of the towns on the Sella have specialist companies who offer canoeing excursions, or the hire of the canoes and some hotels will even make the arrangements for you. If you plan to visit the area in August and intend to hire your equipment, you should seriously consider making your plans in advance to avoid disappointment. As a cautionary note, you should be aware that the levels of canoe training and supervision in Asturias may be different to the country in which you live. If you have never canoed before and intend to have your first experience on the river Sella in Asturias, you should be diligent in ensuring that you are adequately trained and satisfied that your safety is assured. You should also make sure that your travel insurance covers this kind of activity. 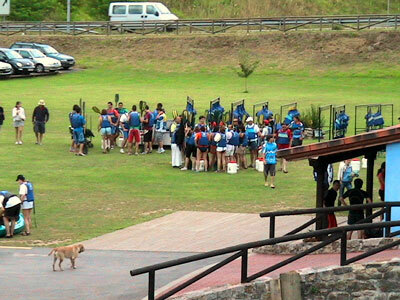 Above, "Would be" canoeists awaiting some basic training before being set loose on the river.